Masaryk University can grant the trademark “Tested in Antarctica” to any technology or product which has endured the extreme conditions at the Czech Antarctic Station of J. G. Mendel on James Ross Island, which contributes to the marketing potential of the tested product or technology and can increase its sales. The owner of the European trademark “Tested in Antarctica” is Masaryk University. The trademark was registered with the European Union Intellectual Property Office (document No. 017486391). Who can obtain the trademark? The right to use the trademark is granted by Masaryk University only to such products or technologies that have retained the properties stated by their producer even in the harsh conditions of the polar station. Masaryk University evaluates specific properties of certain products and technologies – passing the tests indicates the product’s or technology’s specific quality. Masaryk University retains the right not to grant the trademark to technologies or products which, according to a member/members of the expedition, did not endure the Antarctic conditions. The right to use the trademark “Tested in Antarctica” thus indicates specific qualities and properties of products and technologies used under extreme conditions. How is the testing carried out? The testing is carried out by the Masaryk University polar expedition which brings the products or technologies to the Czech Research Station of J. G. Mendel, where the members of the scientific expedition test them for the properties declared by the producer in the demanding polar conditions. The testing is usually carried out by using the given thing for a certain period of time in the Antarctic environment. 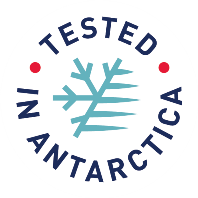 The exact conditions of the tests and the results recorded by a member/members of the polar expedition can be found on the website tested-in-antarctica.com The data are provided separately for each product to help consumers find the qualities of any given product or technology (and make sure that the significance of the "Tested in Antarctica" trademark for any given product or technology is apparent). The website also provides information on the length of the testing, the specific conditions under which the testing was carried out, the results of the testing and the member/members of the expedition which carried it out. In duly justified cases, Masaryk University retains the right not to accept a product or a technology for testing. How can one use the trademark? On the basis of positive results (technology or product passed the test) of the practical tests that have been carried out, some producers will be granted the possibility to use the trademark with a specific product or a technology in order to promote it. The specific conditions under which the trademark "Tested in Antarctica" can be used are subject to an agreement between Masaryk University and a producer.